Since 2011, while overall power rates have remained essentially flat, the minimum or fixed-fee portion of residential electricity bills in the Tennessee Valley has jumped by an average of 50 percent and will rise even more next year if TVA approves a proposal to again restructure its power rates. The rate realignment that TVA will unveil next month is not designed to raise more money for TVA. But it will allocate a bigger share of the cost of power to fixed charges while lowering the marginal cost of each kilowatt- hour purchased. The proposed change was denounced Friday by dozens of consumers and environmental activists, who appealed to TVA's new board to reject the idea. "In reality, high fixed charges are known to be disproportionately burdensome to low-energy users and low-income ratepayers because they reduce customers' ability to control their energy bills," said Brianna Knisely, the Tennessee Energy Savings outreach coordinator for Appalachian Voices. "If local power companies add these fixed charges on top of the 1.5 percent rate increase that TVA approved in October, many families who are already struggling could end up having to choose between necessities like food and medicine and paying their electric bills." Memphis residents who traveled to Chattanooga by bus to voice their concerns said some of their neighbors had power bills in January for as much as $800. "How are they going to buy their medicine, eat, pay their utility bills, and live?" said Virginie Banks of Memphis. Stephen Smith, president of the Southern Alliance for Clean Energy (SACE), said the fixed cost portion of his Knoxville Utilities Board bill has nearly tripled since 2010 and will soon go up above $20 a month, compared with only $6.09 in 2010. Chattanooga's EPB has raised its fixed fees the least of any of TVA's major distributors, but EPB has boosted its mandatory minimum charge from $6.89 in 2011 to $9.36 this year, according to a new SACE study. "Fixed fees are exploding across the Valley and there is not a cost-of-service study that has been done to justify this change and that is malpractice," Smith said. But such fixed charges are typical for water, gas and other electric utilities to cover the cost of maintaining reliable connections for power delivery at all times. Even where the local power companies have added higher fixed charges, the amount of fixed charges for the typical customer in TVA's seven-state region is still a relatively minor part of the overall bills — averaging about 10 percent of the average residential bill, TVA chief financial officer John Thomas said. TVA estimates nearly 70 percent of its overall costs are fixed since the utility has to maintain its power generating capacity and transmission lines to meet power demands regardless of what the electricity load is at any time. The fuel cost portion of the typical bill is only about 30 percent of the costs for TVA, Thomas said. "What we are trying to do is match the cost of our product with its causation," Thomas said. "Most of the investment in the generation and transmission system has already been made, and when you have all of those fixed costs represented in a kilowatt charge, what you end up with when you have cold January weather or very hot summertime temperatures is a real spike in power bills. By having a fixed component of the bill that doesn't change when you use more electricity because of the weather, it helps stabilize the bill and customers don't have as extreme variation in their bills." TVA President Bill Johnson said rate changes adopted over the past five years have actually helped to reduce the typical residential power bill by 2 percent and improved TVA's relative ranking among the top 100 utilities into the top 25 percent for residential rates. TVA's industrial rates have fared even better, offering the eighth lowest industrial rates in the country after TVA cut its average industrial power charge by about 20 percent over the past five years. Johnson said lowering industrial rates has helped the Tennessee Valley attract more than $40 billion in new business investment in the past five years, including the announcement last month by Toyota and Mazda that they will build a $1.6 billion auto assembly plant in Huntsville, Ala., that will employ 4,000 workers. "When I came to TVA [in 2012] we were losing production from the Valley and we were winning no new prospects, which is a big part of our economic development mission," Johnson said. "We decided we needed to look at the rates and it turned out that I think we did have a misallocation of costs to the industrial class, especially for fuel costs." Lloyd Webb, an energy specialist for the Olin Corp. and chairman of the Tennessee Valley Industrial Committee, said Johnson's commitment to look at a rate alignment helped convince Olin to expand in Charleston, Tenn., rather than its other plant in Augusta, Ga., even though at the time energy costs were lower in Georgia. "Increasing the industrial load with lower and fairer rates actually helps to also lower residential rates," Webb said, noting that industrial customers use more power at off-peak periods. 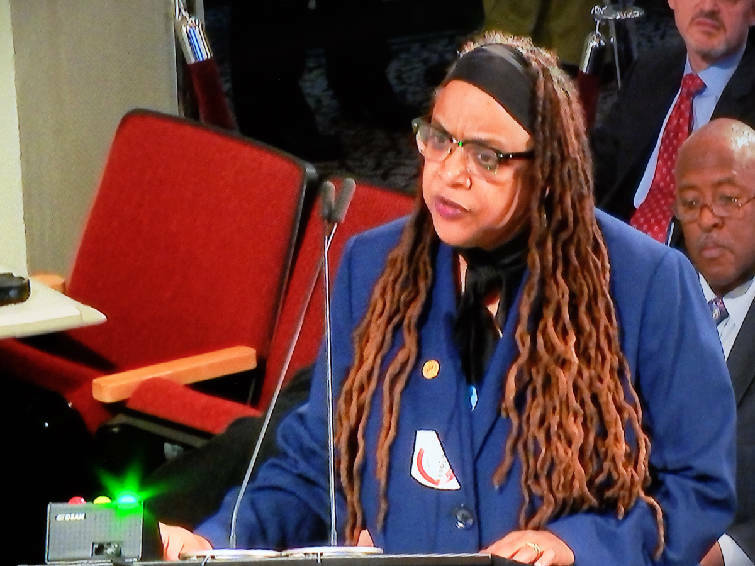 But Sandra Upchurch, representing the NAACP 's state conference, objected to what she sees as TVA's move to help industrial rates at the expense of ordinary residential customers. "Imposing mandatory fees is an injustice while you give industry breaks on their rates," Upchurch said. "You want us to pay for your mistakes. You seem to be putting profits ahead of people." Supporters of renewable power also object to TVA and its distributors imposing higher fixed rate charges while cutting the premiums paid to buy renewable power. "For the last decade, TVA has been a leader in clean energy development in the Southeast," said Rory McIlmoil, the energy savings program manager for Appalachian Voices. "However, if TVA adopts this new rate structure, it will stifle the growth of clean energy across the Tennessee Valley, as well as the jobs and other local economic and environmental benefits that could be generated for years to come." But TVA directors and local power company leaders pushed back on those charges. TVA Director Eric Satz, chairman of the TVA external relations committee, said TVA wants power users in the Valley to be able to put solar panels on houses and to use other renewable options. "But those people still have to pay for the system that they will rely on for back up generation," he said "Many of our low-income customers cannot afford to generate their own electricity [with solar panels, windmills or other distributed energy] and should not have to pay to subsidize others to do so." Mike Partin, president of the Sequatchie Valley Electric Cooperative, said the municipalities and power co-ops represent the people in the Tennessee Valley. "Our cause is the people's cause," he said. "We have an 80-year-plus history of service working for the people of this Valley."